The studio is becoming such a pretty, inviting, inspiring place to work and create. When we moved in to the house, this space was just a big unfinished area above the garage. 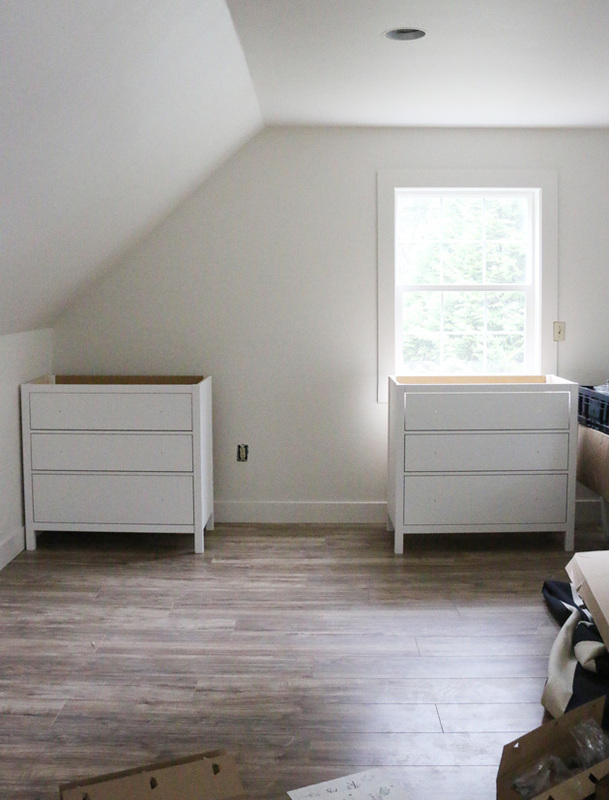 We finished it out with a little bit of framing, cleaned up the drywall, added can lights, installed super inexpensive floors, painted with Sherwin Williams Shoji White and trimmed out the windows and baseboard (see the before + after post here). 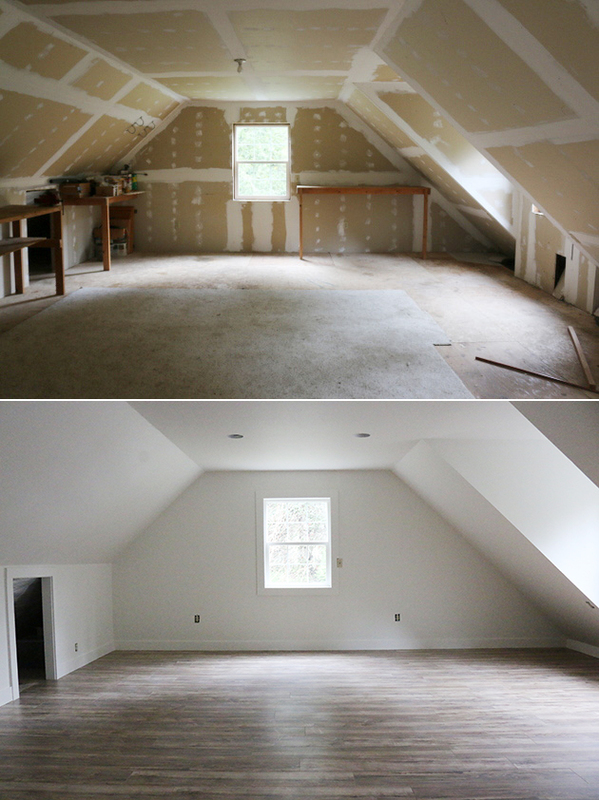 Once the shell of the room was complete, it was time to figure out how to make it most usable. I pinned a bunch of inspiration images to my office Pinterest board and Ryan (who is much better at space planning than I am) came up with a layout. 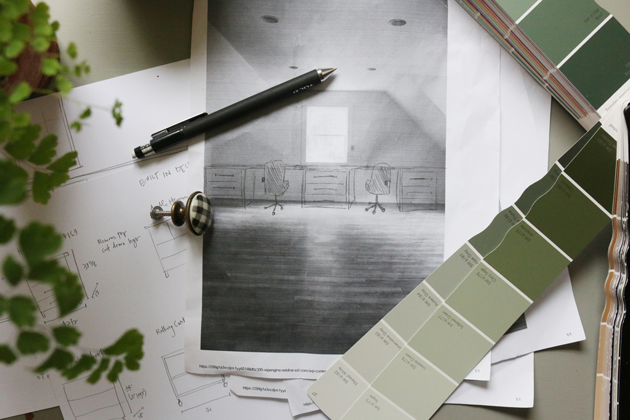 In order to visualize a space all pulled together, I like to create a design board (here is the design board for the studio). It helps me make decisions without having to actually purchase items. We knew we wanted a long work surface along the back wall and it was just a matter of coming up with a practical, affordable, nice-looking way to make it happen. After lots and lots of research on desk options, I finally settled on a diy version – or as they say, an IKEA hack. The idea was largely inspired by this photo of an ikea dresser that had been dressed up with paint and brass hardware. It was just the look I was wanting in the studio and while not the perfect dimensions, it felt worth a try. I bought and put together three of the Hemnes dressers, leaving the tops off. The height of the dressers is 37 3/4″ which is much too high for a desk, so Ryan cut off the legs. To top the dressers, I used two 98″ pieces of countertop from IKEA. This particular counter is not solid wood – just a top layer – but it can still be oiled and sanded as needed. It came in these long lengths that fit along the back wall perfectly and allowed for enough room between dressers to pull up a chair comfortably. The main problem we ran into is that the finished height is taller than the average desk. The finished size with the legs off and top on is 33 5/8″ while a standard desk sits at between 28″-30″ tall. I don’t mind a taller than average desk at all as I am on the taller size (5’7″), but from experience, I know that sitting in too-low of a chair makes for crampy shoulders and neck. We ordered the most beautiful leather adjustable chairs that raise to 22″ thinking they would be just the right height … but alas, they are just a few inches too short. I talked about that debacle on this post. They are almost usable as is, but I start to get a shoulder cramp after sitting at my computer all day since I’m scrunching up my shoulders to type. We talked about switching up the desks to lower the height of the top, but ultimately stuck with the original vision and will be altering the chairs instead. We have a plan for that, but haven’t done them yet. I’ll share details once we’re done. For now, I’m just dealing with the chair height and enjoying how pretty the office looks. Instead of using the small black knobs that came with the dressers, I switched them out for these super inexpensive brass-lookalike pulls. They really give the dressers that classic modern look I was going for. As for the downsides of this IKEA hack desk, I can only think of two so far. The first issue: there is space between the back of the dresser and the wall. The countertop depth is 25 5/8″ and dresser is 19 5/8″. We just cheated the dressers forward which left that gap back there. It honestly doesn’t bother me at all … but it is just something to consider. Second issue: the desk doesn’t run all the way to the edge of the wall. Ideally, we would have a built-in desk that ran the full width of the wall. Since the countertops only come in two lengths and we went with the longest, this is as far as the desks can span. Sure, we could have gone with a different countertop, but I was going for ease and a pre-made countertop was just what we needed. I just put my baskets of wrapping paper in the empty space and it works great. Before the spring tour (did you catch that post? If not, here it is!) I unloaded boxes and boxes of officy/crafty things and organized the drawers. It is so nice to have so much storage. I’ll show you inside the drawers soon. Overall, this has been a very worthwhile IKEA hack. 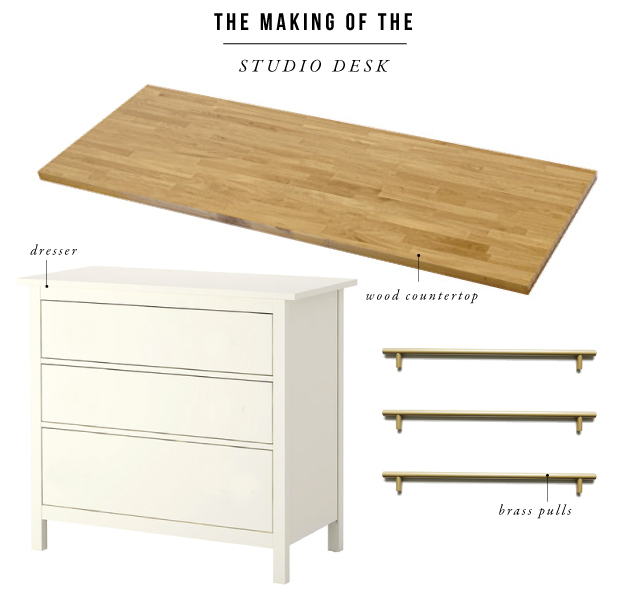 The total for the three dressers, two countertops and 9 pulls was $835 which is well under what it would have cost to have a custom wall-to-wall desk built. 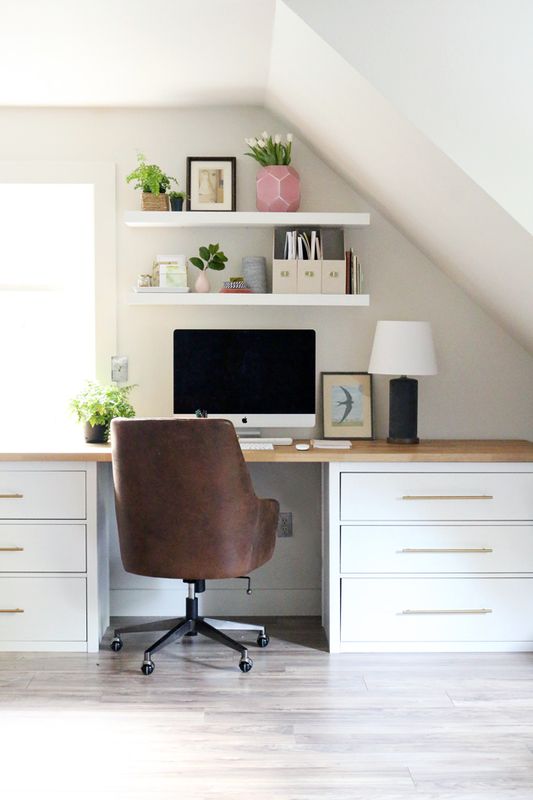 Having that long workspace and lots of storage is so practical and looks great in the room as well. A win all around! Are the countertops the birch or the beech color?? 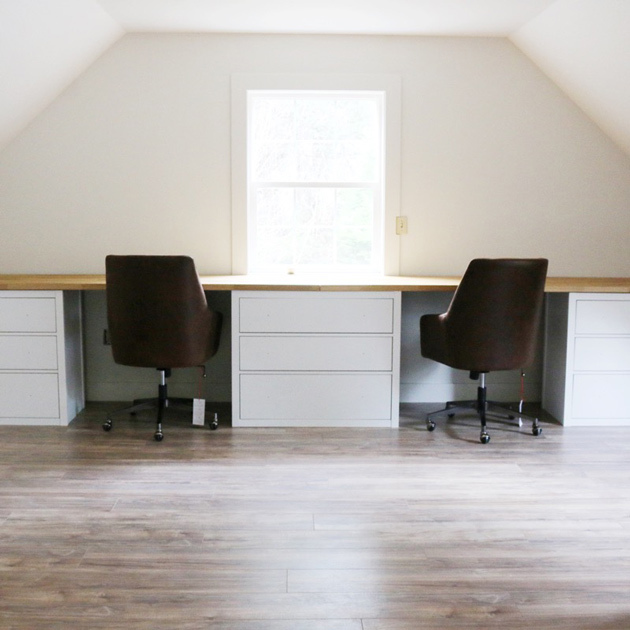 This is BEAUTIFUL — came across this post looking for ideas for my new home office (in the process of rebuilding after Hurricane Harvey). Quick question — are the drawers deep enough to hang a hanging file system (or otherwise store letter-size manila files)? I love this space! Any information about the floating shelves? They are from Ikea – lack shelf. Love this! How much room did you leave between each dresser? Brilliant job. What are the measurements of one floating shelf. Thanks. I came across your image on Pinterest and started drooling… I am in LOVE! We have a bonus room just like this almost to a T. We are trying to copy your design for our daughter. I’m super excited, and I just wanted to thank you for sharing all this. Truly helped me out because I never would have envisioned this. Thank you!!!! Did you end up painting your IKEA drawers / cabinets before you installed them? Thank you! I did not. They are just the stock white. 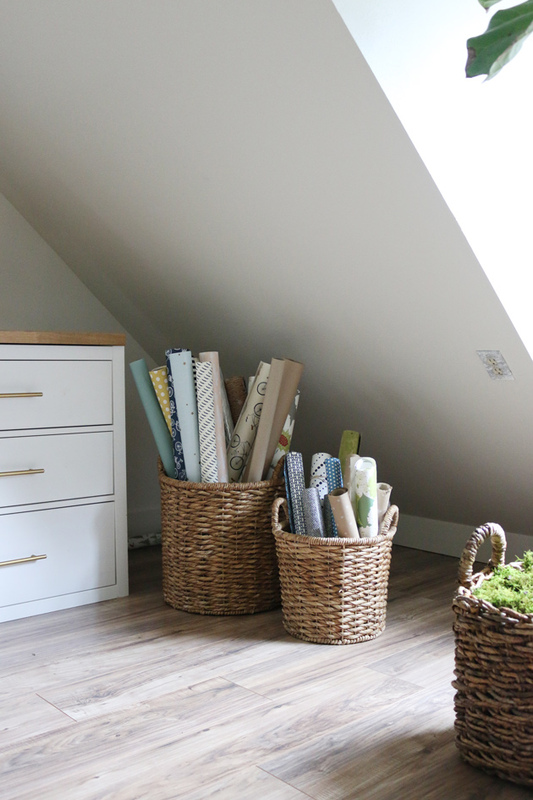 LOVE THIS, doing in a smaller space with a smaller set of IKEA drawers. Can you please tell me specifically what wood counter you used at IKEA? I don’t want to pick the wrong one, some have orange undertones. Your warmth looks ideal! The link you have previously provided ( thank u) goes to all countertops. Thanks so much I appreciate! P.s. I just redid a small powder room on a budget and used a great $40 “oil rubbed bronze” faucet that looks almost matte black. Matte black faucets are crazy expensive!! I’d also like to know which counter top was used? Thanks, it’s a beautiful room! Hi! Oh, wow; your space is beautiful! 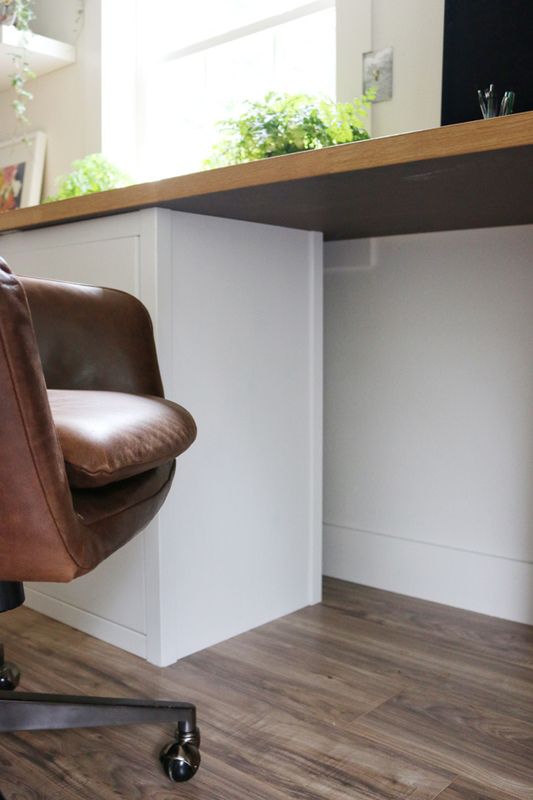 I have been working on a very similar project and found just what you did… chests of drawers really don’t come in the right height for a desk. I’m also small (4′ 10″ so finding a chair to fit I think will still not do the trick for me for many hours at my desk). Have you found anything else that might have worked in place of the dressers? Love the new space you’ve created! Hi! I love this! Have you found a solution for the chairs? I’m thinking of doing this hack for my office but spend a lot of time in my chair, so having a chair that works height-wise is very important for me. I’m flexible on style of the chair since it needs to be more functional than pretty in my case. Thanks! 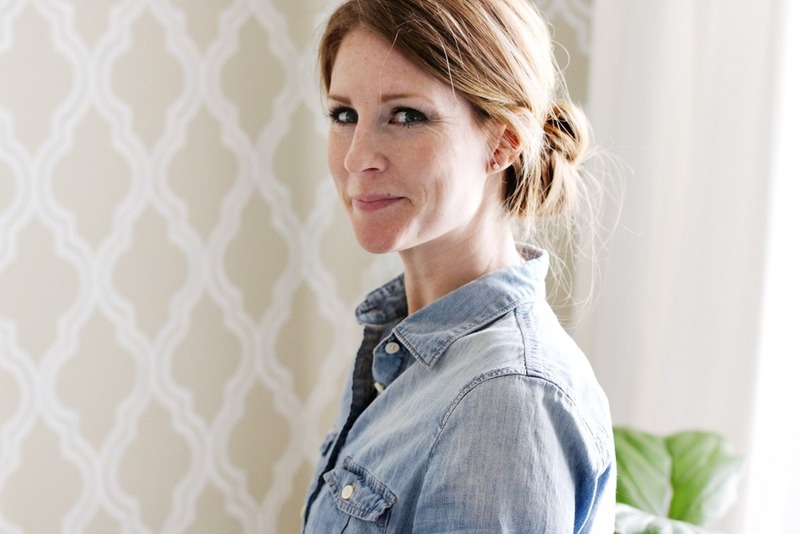 Love this look and doing something similar in our new office. Where are the floating shelves from? the shelves are from IKEA. SO PRETTY! I’m considering doing the same thing (based on the same inspiration picture you worked off of), for a baby nursery! Do you happen to remember what the space between the pre-drilled holes were? I may have found a source from amazon with pulls that are cheap enough (less than $20 per pull) and in the brass gold color! Love your chairs – where are they from?? thanks Emily – space looks gorgeous! 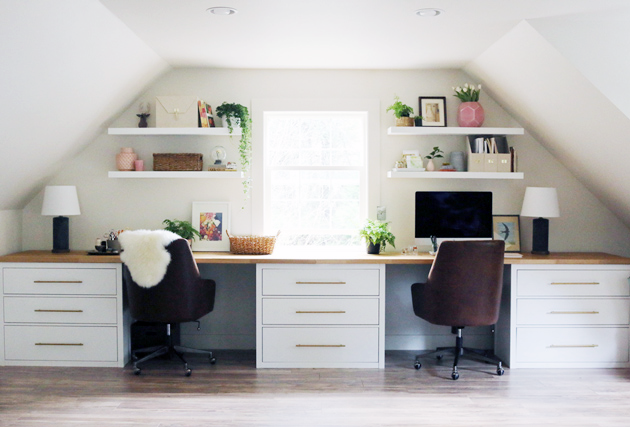 We were looking for ideas to convert or sunroom into an office space and stumbled across your blog! I love the desk in your studio. Just wondering if you have file drawers in that desk at all? We don’t have any file drawers in the desks – they are not quite deep enough for file storage. I do have a file box on the shelves for any important papers and we have an official file cabinet in Ryan’s office. Love the look! What length brass pulls did you guys use? I’m working on something similar and I love the proportion of yours! Hi Emily! I think I’ll do this in my office. Did the pulls you bought fit perfectly in the original holes? I’d like to avoid filling holes or painting. Thanks! Nope. I had to fill the holes. Love it! Can you see where the holes for the original pulls? I can’t tell in the pics! I love the ones you put on. I would love to see how you’ve organized the insides of your drawers, that would make another great blog post! Thank you for sharing, this space looks so bright and clean! I love it! The seam between the two countertops.. is it flush? Does it bother you? This is darling by the way!! Huge fan of your style!! Thanks for sharing…. The seam is almost flush. I wouldn’t write on top of it, but that is not a surface I’ll use for writing, so it’s okay. Thanks for the kind words! Did you use an underlayment when you installed the floors? I am looking at using inexpensive flooring for my girls room. Do you like it so far? Any complaints? Thanks! Yes, we did use the underlayment that was suggested with the floor. We went with the slightly more expensive version to try to avoid the hollow, echo-y sound laminate floors can make. I don’t have any complaints at all about it! Does Ryan work at home too? I was thinking you were both going to be up there, but like it even more now that it’s just you with all of that space! Looks incredible!!! In the meantime with your chairs, you can sit on a small pillow! That’s what I do when I’m working at home, since we don’t have a home office I use the dining table. But it’s too high so I just grab a throw pillow off the couch and put it back when I’m done! I’m trying to redo my craft/office room and love this idea! Did you consider using actual lateral file cabinets? I love the look of the cabinets you used but need the functionality of space for files. Just wondered if there’s a reason this might not work with file cabinets instead. I did consider file cabinets but decided against it. I don’t actually need filing storage (Ryan has a file cabinet in his office where our paperwork/bills/etc are stored) but did need storage for craft and office supplies. My mom has a desk very similar to mine using an ikea countertop and three file cabinets she had sprayed at an automotive paint shop and it looks great! Absolutely beautiful!!! Where did you purchase the baskets that store your wrapping paper? The wrapping paper baskets are a few years old from Target. Absolutely love this IKEA hack – I copied it but used some of the IKEA Alex drawer units instead as I have a smaller space and it works wonderfully. I would never have thought of pairing a kitchen countertop with drawers but it is absolutely perfect, so thanks for the inspiration! 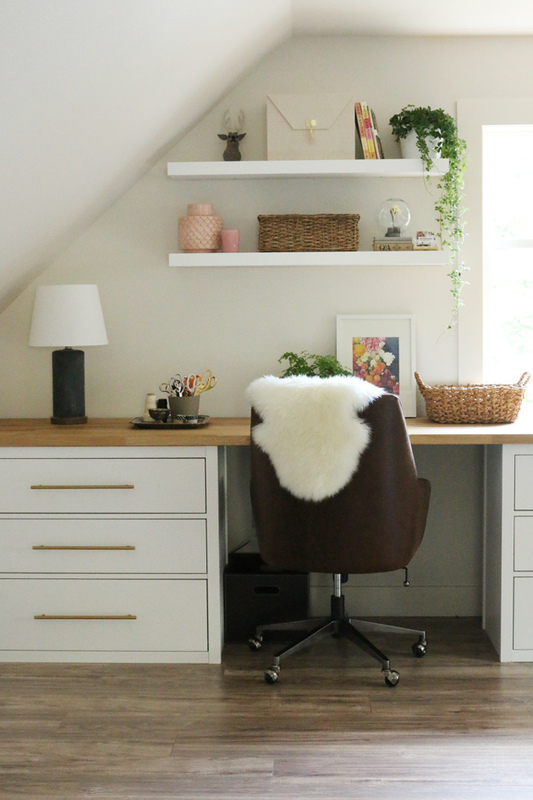 This desk idea turned out so pretty and functional! Great job! We are about to start a major renovation and I would love something like this in my office if we have to tighten the budget and scrap my beloved built-ins. Question: What do you use the dresser drawers for? I need file storage; would they be suitable for hanging files? I have all of my craft/office items in the drawers and they are fabulous storage. However, a hanging file would not fit. Looks great. I am inspired, but also wondering if there is a seam showing where the two counter tops come together? How did you seam them? Glue, or not? There is a seam where the two counters touch right in the center of the middle dresser. They are so heavy, they are just resting on the drawers for now – perhaps we’ll secure them at some point. If you did secure the tabletop to the drawer units, how would you do it? I think you could use l brackets under the dresser and into the bottom of the top. Having that space behind the dressers is a great place to hide electrical cords and such. Unlike the spaghetti like bundle I have below my desk! Good job, it looks great and functional too. Beautifully done, I love the desk area. I really like the flooring choice, what brand is it and the color. Great Job! I feel like that empty space on the right, where the baskets of paper are, would be great for a pinter. Certainly you have to have a printer in here. Where is it. This is beautiful by the way. That space would be good for a printer on a little cart. Great idea! My printer is still packed away … someday it will come out of it’s box :) We have a second printer in Ryan’s office in the house so that is the one that gets used the most. Looks so great! Thanks for the inspiration. Love it! Are the drawers (bottom drawers) deep enough to hang file folders? Looks great. A beautiful space to work in. I love it !! thanks for sharing ! The countertop is just resting on the desks for now. I’m not sure they need to be attached as it’s just me up here working … but, we may add l-brackets to secure the tops to the inside of the dressers (if we remove the top drawer, we can fit a hand in to drill). Love this space. One window brings in so much light. My question: how did you finish the tops? I didn’t do anything to the top. You can oil it, but I have not. Brilliant! You’re so good. Thanks for all the inspiration. I’m in the midst on a bungalow blow out renovation and also a tiny house interior finish. Keep your posts coming. Love them and always learn something! I really like how the desks look and the room is coming together beautifully. Have you thought about pull-out trays for the keyboard? They can be purchased or built (my sister built one for my mom). How do you keep the countertops on the desks? Did you glue it some way? The countertop is just resting on the top of the dressers. So far it has not been a problem at all!